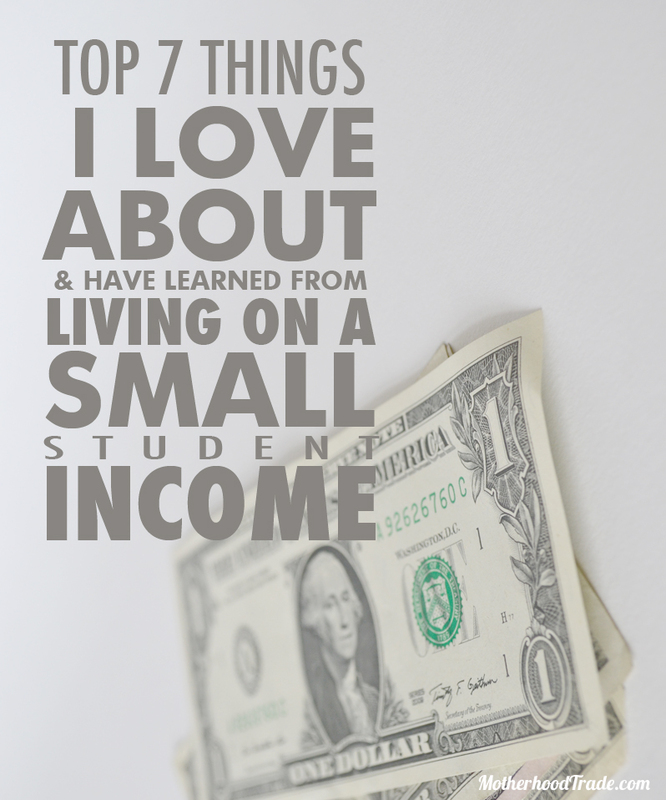 Yes, you read right..things I LOVE about NOT having too much money around. Sure it can be sometimes frustrating pinching pennies, passing up wishes and outings because the bank account doesn’t measure up but living like this my entire married life has taught me that I can still be extraordinarily happy with the little money we have and make what we have totally sufficient for our needs. And a human’s needs financially are actually much more minuscule than what most of us think. Here are my 7 top reasons I love being about “poor” (even though quite honestly I know we really aren’t) . Living simply: Although there are plenty of things I see that might be nice to have it is almost refreshing to know that I won’t get it simply because we can’t afford it (and because we actually don’t really need it). It almost immediately excludes me from the trend race, you know, the one that makes me feel like I should compete in getting the greatest and latest things all the time. In the end I find that I’m totally content with what I have and what I felt I needed wasn’t even necessary. In fact, I’ve found that diving into that empty trend race really only makes me want MORE. There is ALWAYs something greater, cuter, more convenient, faster, smarter, always making me feel like what I have is never enough. Choosing to be happy with what you have is the ONLY way that you will ever feel satisfied. Making the most out of everything: Since I know that I can’t just run out to the store to buy whatever I want or need when I want it encourages an extra push of creativity, upcycling, repurposing and thorough use of most everything. Two simple examples: I wanted to tackle the mail and paper mess in our house. 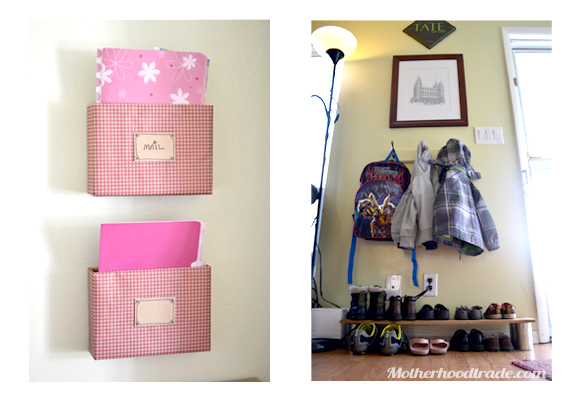 My friend had a very cute wire file organizer on her wall from potty barn and I wanted to mimic the same concept. I found a long sturdy box that I cut in half to make two boxes, wrapped them with wrapping paper, added labels, stapel gunned them to our wall, filled them found cute folders I already had in a filing box and now we have any organized way to contain our mail and papers. The second example is I wanted a place to organize our shoe explosion by our front door and was thinking of getting a shoe shelf but before I ran out with cash in hand to get one I had to think…”hmmm, what do I have already that might work for what I want here? Something flat like a shelf: piece of wood here. And something that would help it be just slightly above the ground. Nail empty tin cans?? Sure, why not. And in just a few minutes I went from a shoe mountain to sweet little organized ‘shoe corner’, as we say to our kids, for a home to the tender little shoes of my wee ones. Some might say total ghetto, but I LOVE it. It’s functional, was so simple to make, and it warms my mother heart to see those little shoes all lined up like that. Budget and careful planning: As things have gotten progressively tighter with the growth our family and less time for me to work we have learned it essential to budget our all our expenses since frivolous spending is just not an option anymore. We carefully evaluate purchases and really use whatever it is we get. We are still learning how to improve our spending habits, budget and how to allocate our money get the most out of it. It is not just about what stuff you can get with how much money, it is more importantly the discipline learned with budgeting and the reward of being able to control your money and not let it control you. Career push: To make ends meet I do some freelance on the side. I love what I do but had we not been as tight as we are I would have felt less need to carefully plan out my time and energy to squeeze in a few hours a week. It has not been easy trying to bring a few extra bucks but it has helped me develop my skills, learned use my time wisely, and brought a lot of satisfaction. Home cooked meals and meal planning: Going out to eat is rarely an option and with the necessity of having to eat and feed a family starting right at me I had to buckle down and get organized (whaaaa??) to get us some meals on the table. Since I really struggled with it I deviced a meal plan that has been working quite fabulously for us. And guess what? Family meal time is SO valuable. Chatting, giggling, sharing, eating healthy home cooked meals, what could be better for your soul!?? Finding joys in the basics: I’m finding that we don’t really need much to be happy. The basics that keep us alive can also bring us plenty of happiness. When we don’t have much to spend we can’t really afford to be distracted by things to get and do beyond the basics. It keeps us humble, grounded and growing. It helps us keep love and God near. I’m not saying the lack of money equates goodness nor I’m not saying money it is of its self is bad. Of course it is great and can help us and others do great things but I think if I can learn happiness now and remember how full our lives were with little and all the joys and things are learned from it then I can remember to be happy in the future when money might come more freely. My ultimate hope is that I can learn to live a rich enough life living simply so we can freely give help to enrich the life of others. Now that is happy. What tricks have you found to help make ends meet and cherish what you DO have?.